Which cereal was introduced at the same time as Count Chocula Cereal? See the Top 100 Breakfast Cereals. This cereal was a crunchy, cinnamon rice cereal targeted to kids ages 8 to 12. It was the first non-flake line extension for Tony the Tiger, who at the time of the cereal's introduction had an 88 percent awareness rating. The product is rice-based rather than corn-based, as Frosted Flakes are, and the crispy flakes are coated in cinnamon, the fastest-growing cereal flavor in the children's market. Happily, the cinnamon flavor is not lost when milk is added and the cereal stays crunchy in the bowl. I also enjoyed it as a crunchy snack right out of the box. 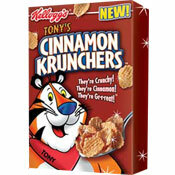 What do you think of Tony's Cinnamon Krunchers? View all 112 comments for this cereal. We need this AWESOME cereal back immediately! This was my favorite cereal ever. Really miss it. I wish THIS would get brought back. I don't want Cinnamon Frosted Flakes... I want Cinnamon Krunchers! I am guilty of having ate whole boxes of this in a rather short time in the past, haha. Kellogg's - please bring this cereal back. It was my all-time favorite. PLEASE! I'm 47 and wishing for Cinnamon Krunchers. I remember having this cereal when I was six. I didn't care if that cereal was geared for kids eight though twelve, but I had a great time with the cereal with or without the milk! I also thought it was THE BEST! I need this cereal back. It was a part of my soul, now the Krunchers are lost in time. I you got to try this, you'd agree that it was the BEST cereal ever! They were Gr-r-reat! Gr-r-reat until they were gone. 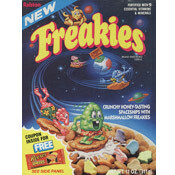 I absolutely LOVED this cereal - PLEASE bring it back. I miss my Cinnamon Krunchers! If this cereal has a chance to be brought back, it's going to take thousands of emails to Kellogg's. So we all need to get busy and do our part!